Over the last two and a half years, Heroes Lounge has grown to be the largest Heroes of the Storm amateur league worldwide. We have created a way for players from bronze to grandmaster to experience the game in an organised, competitive setting. The way Heroes of the Storm is meant to be played. We believe that everyone should have a chance to experience the thrill of competition at their own level. Last summer, after several successful seasons in Europe, Heroes Lounge launched in North America. 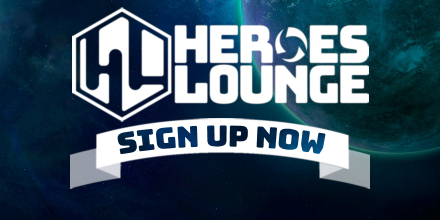 Heroes Lounge is a home for everyone with an interest in playing Heroes of the Storm competitively. This means you can sign up as a team, with some friends or as a free agent to enjoy challenging matches in different divisions. If you do well, we’ll see you compete with the other top teams in our cups or championship tournaments. The signups for North America will close on the 24th of March (11:59 pm PST). After the signups close the teams will get seeded into divisions, after two weeks, the battle will break loose and the first round of matchmaking will commence. So don't miss out and sign up NOW. There are several ways to play in in our seasons, but first of all you need to make sure you have an account on our website. You can register an account here. In order to register, you'll need your Discord ID (and to join our discord server) as well as your battle.net ID. Please make sure you register with your main account, smurfs are not allowed, and matchmaking will be done based on region, the mmr of your main account. Firstly, you can be in complete control over your team by creating your own team. In order for your team to compete, you will need at least 5 members including yourself. If you don't have any friends or want to make new ones, you can use our Discord server's recruitment channels. Here you can advertise your team or respond to players looking for a team. You can decide yourself who you want to add to your team and if you want to play with them beforehand. As a captain of the team, you will also be responsible for a lot of the administrative duties that come with the competition including scheduling matches, team practices and uploading your results. Luckily we have a captain's guide and will assign all new teams a mentor to help you with all this. Make sure to mark your team as participating for season 8 or the NA season in the manage team screen. Please note: if you do not have 5 members before the start of the season free agents will be assigned to your team to fill up your roster. If you don't want to be placed into a team by our very well organized rigging masters you can find a team to join yourself. The best tool to use is our Discord server. In the Discord server, there are several recruitment channels that can help you find a team: #teams_recruiting_na/#teams_recruiting_eu and #players_to_recruit_na/#players_to_recruit_eu. You can advertise yourself, or respond to captains looking for an extra team member. It's not uncommon for a team captain to want to play some games with you to add you to his/her roster. Once you found a team you want to join, you can find out how to join them using our sign up guide. Please note that if you want to find your own team you should NOT sign up as a free agent, signing up as a free agent will put you in a team without your choosing. You can join a team throughout the season, although extra rules apply to what teams you can join. As a free agent, you will get assigned a team at the start of the season. This can be an existing team or a whole new 'FAT' (Free Agent Team). Incomplete existing teams will have free agents added to form a roster of 5 players. All remaining players will be allocated to a FAT (free agent team). In a FAT, players are allocated in a roster of 6 players. When you are placed in a FAT roster try to contact the other members using their Discord IDs, even if you are not assigned as captain. This will help you bring your newfound team together. Every FAT team will also be assigned a mentor to help free agents to find each other and become a team. The placement into these teams is based on your MMR, so make sure you have uploaded all your replays when signing up! Want to sign up as a free agent? Read our sign up guide here! Now that you've decided your path to take, we look forward to seeing you, in the Nexus! A short summary about the 2 new maps in the pool.